At its re:Invent conference in Las Vegas, AWS today announced the launch of Arm-based servers for its EC2 cloud computing service. These aren’t run-of-the-mill Arm chips, though. AWS took the standard Arm cores and customized them to fit its needs.The company says that its so-called AWS Graviton Processors have been optimized for performance and cost, with a focus on scale-out workloads that can be spread across a number of smaller instances (think containerized microservices, web servers, caching fleets, etc.). The first set of instances, called A1, is now available in a number of AWS regions in the U.S. and Europe. They support all of AWS’s standard instance pricing models, including on demand, reserved instance, spot instance, dedicated instance and dedicated host. For now, you can only use Amazon Linux 2, RHEL and Ubuntu as operating systems for these machines, but AWS promises that additional operating system support will launch in the future. Because these are ARM servers, you’ll obviously have to recompile any native code for them before you can run your applications on them. Virtually any application that is written in a scripting language, though, will probably run without any modifications. Prices for these instances start at $0.0255/hour for an a1.medium machine with 1 CPU and 2 GiB of RAM and go up to $0.4080/hour for machines with 16 CPUs and 32 GiB of RAM. That’s maybe not as cheap as you would’ve expected given that an X86-based t3.nano server starts at $0.0052/hour, but you can always save quite a bit by using spot instances, of course. Until we see some benchmarks, though, it’s hard to compare these different machine types. As Amazon’s Jeff Barr notes in today’s announcement, the company’s move to its so-called Nitro System now allows it to launch new instance types at a faster clip. Nitro essentially provides the building blocks for creating new instance types that the team can then mix and match as needed. 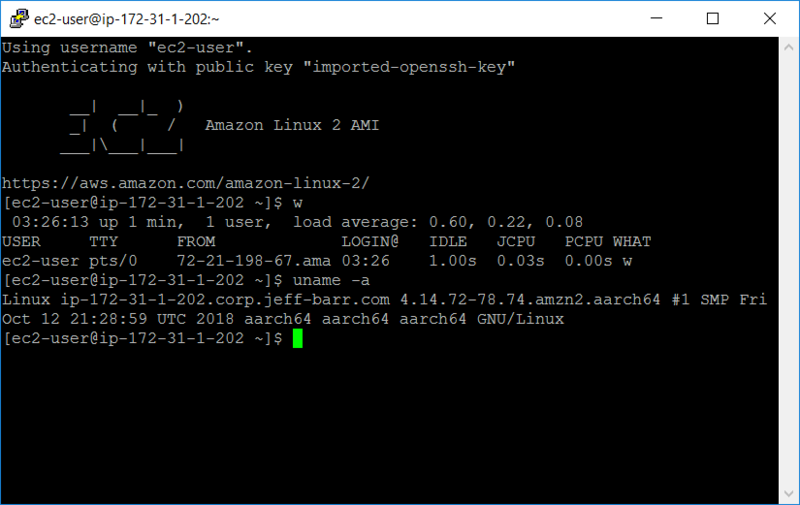 It’s worth noting that AWS also launched support for AMD EPYC processors earlier this month.